Suicide is the tenth most common cause of death in the United States. It was the second leading cause of death among individuals between the ages of 10 and 34, and the fourth leading cause of death among individuals between the ages of 35 and 54. In 2017 there were more than twice as many deaths from suicide as homicide in the United States with an average of 129 suicides per day. These startling numbers indicate a need for suicide prevention awareness and basic suicide information. With a Google search returning 292,000,000 results, finding that information can be overwhelming. Reliable, current, and authoritative information can be found using resources from the National Library of Medicine, National Institutes of Health and other government agencies, as well as national organizations. According to the American Foundation for Suicide Prevention (AFSP), “there is no single cause to suicide. It most often occurs when stressors exceed current coping abilities of someone suffering from a mental health condition.” Using plain language and an easy to understand design, the risk factors and warning signs on the AFSP site can help you raise awareness among the general public and your communities. AFSP raises awareness, funds scientific research, and provides resources and aid to those affected by suicide. The National Institute of Mental Health (NIMH) is the lead federal agency for research on mental disorders. NIMH is one of the 27 Institutes and Centers that make up the National Institutes of Health (NIH), the largest biomedical research agency in the world. 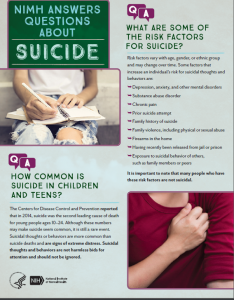 Via NIMH, you can find topics on prevention, and publications such as Suicide in America: Frequently Asked Questions and NIMH Answers Questions About Suicide. The National Suicide Prevention Lifeline is available 24/7. You can promote and publicize this information to help those in crisis. Anyone can call the National Suicide Prevention Lifeline at 1-800-273-TALK (8255) or contact the Crisis Text Line by texting TALK to 741741. MedlinePlus, a trusted health information web site produced by the National Library of Medicine, is the National Institutes of Health’s web site for patients, and their families and friends. Information found here is authoritative and up-to-date. On the Health Topics page for suicide, you can find information appropriate for specific audiences such as teenagers and patient handouts. MedlinePlus also provides links to find an expert and NIH clinical trials. For those of you who are interested in this topic, sign up for MedlinePlus email updates. You will then be able to select from the list of subscription topics. During the sign-up process, you can specify how often you wish to receive emails from MedlinePlus. You can also follow MedlinePlus on Twitter and Facebook. 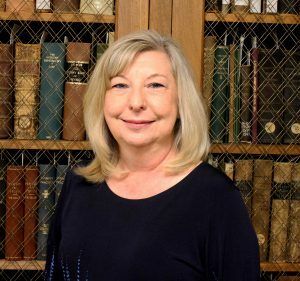 Written by Michelle Burda, Education & Health Literacy Coordinator, for the Winter 2019 edition of The MAReport quarterly newsletter.